At heart, the William & Mary Bike Initiative is removing the obstacles – and excuses – keeping students, faculty and staff off their bicycles. The initiative is a cross-campus collaboration among faculty, staff and students, formalized last year. Its members are the drivers – or riders, rather – behind a new push to promote pedaling, which will be immediately noticeable this year in four new fix-it stations designed to make it quick and easy to repair common bike problems on the fly. The Bike Initiative has also created a new, one-credit course being offered this fall, Introduction to Cycling. Kinesiology 196 will feature group rides and teach the basics of cycling, safety and bike repair. "One of the most agreed upon issues on our campus is transportation,” said Brianna Buch ’15, who serves on the Bike Initiative committee. “That's something that faculty, staff, everyone from the incoming freshman to the person who has been in the administration for the longest time … can see. We have an issue with congestion, we have an issue where we have a city that is a tourist city but has constricted ability to hold a certain amount of cars. Buch admired bike share programs in London and began talking about the idea in Student Assembly, sparking the interest of Gabriel Morey ’15, who was already an avid cyclist. The pair set out to garner support on campus and in Williamsburg, only to learn in November that Parking & Transportation Director Bill Horacio, Sadler Center Associate Director for Operations Rich Thompson and other staff and faculty members had been working for more than a year on a comprehensive plan to help move the campus away from its dependence on automobiles. “Through that talk, we realized it had to be a much larger program than we originally envisioned,” Morey said. “The timing of the whole thing was perfect,” Horacio said. A few years prior, he commissioned a parking study that emphasized alternative transportation options. 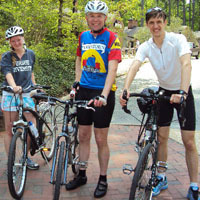 He learned that William & Mary is already a “bicycle-dense” campus, with roughly a third of the community owning a bike. That translates to upward of 2,000. “We estimate that about 90 percent, based on the data that we've collected and the interviews we did, are actually using their bicycles on a regular basis, and about 10 percent are just storing it on campus because it's something they own and they couldn't leave behind," Horacio said. The initiative includes plans to add more bike racks and covered storage, offer summer storage to lessen the number of bikes impounded annually and route money from the sale of impounded and unclaimed bicycles back into the Bike Initiative, programmatically housed in Parking & Transportation Services. Those sales purchased two of the four fix-it stations, which will be installed at the Botetourt and Jamestown complexes, the Daily Grind and the Parking Deck. The Daily Grind sponsored one and the Committee on Sustainability sponsored another. “People bring their bikes and are riding them and have a flat tire and they never have the time to go to Bikes Unlimited or they don't know how to get there or it’s just too inconvenient,” Buch said. “So what these people can do is instead just go and pump up a tube. It essentially eliminates… I would guess another 10 percent of those people who could be riding their bikes or could have them not taking up space on campus." The group is also trying to promote a “culture shift” at William & Mary so that all of those 2,200 people with bikes use them, and so more join them, Thompson said. Thompson commutes by bike to work almost every day and has become a recognized cycling advocate on campus and in the community. Every year more students ask him for advice, help with their bikes or suggestions for rides, he said. “A lot of students are totally unaware of what’s outside this campus, except for CW and Busch Gardens,” he said. Cycling offers them an opportunity to widen their horizons and engage with the community in ways they otherwise wouldn’t, he said. Their ideas have culminated in plans to promote bike lanes and “sharrows,” the painted road markings reminding cars to share the road with cyclists. They have also developed a bicycle-specific campus map, printed a survival guide, set up a website and a Facebook page and had W&M jerseys made. The Board of Visitors received the Bike Initiative with enthusiasm this spring, when Horacio, Vice President for Administration Anna Martin and the students briefed them on the program. Michael Fox, assistant to the president and himself a cyclist, also advised the students. He hopes to link the Bike Initiative with the Virginia Capital Trail, which when finished next year will provide a 55-mile protected bike path between Jamestown and Richmond. Long term, the Bike Initiative is working to establish the bike share program. Horacio said they plan to survey the campus community this fall to nail down William & Mary’s actual needs before trying to find a vendor. The group also hopes to set up an on-campus bike shop that will provide a hub for Kinesiology 196, the W&M Cycling Club, commuters, casual riders and local bike shops. A vending machine could offer parts, such as inner tubes. More immediately is another bike sale, from 8 a.m. to noon on Sept. 6, followed by an expo and a group ride. Students registering their bikes that day will receive a free helmet. “We really want people to stick around and learn about bikes,” Morey said. A scenic bike ride through the historic campus of William & Mary in Williamsburg, Va. Footage by Graham Bryant, Office of University Relations.